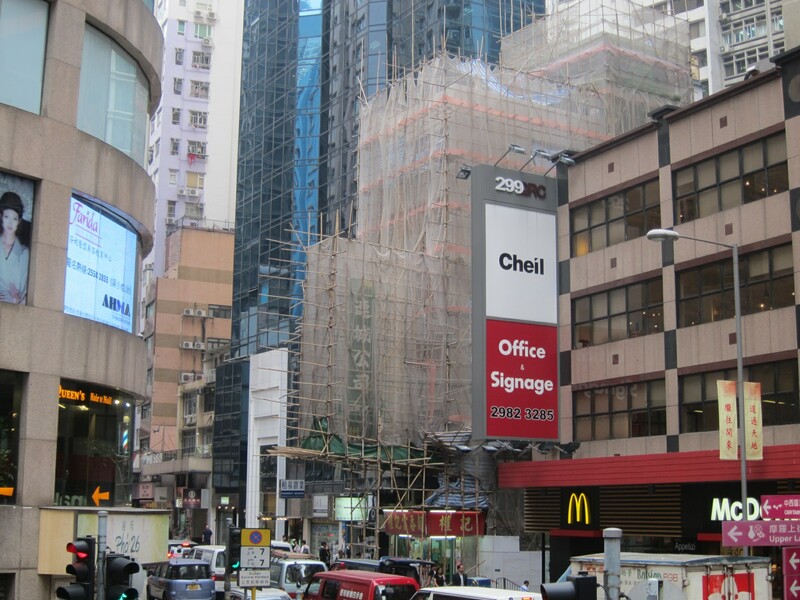 Walking around in Hong Kong, here are some things that just caught my eye. I marvel at how much queuing goes on around here! The orderly way in which locals take to a queue are quite admirable. From queuing for lifts to queuing up for buses at the bus stop. Sometimes I see the end of a queue and have no idea why or what the queue is for. Other times you are trying to work out how the queue works. Take the bus stop example. I wondered at first how there was only one queue at a stop for sometimes 3 to 4 different buses. Finally our friend explained to us that if your bus arrives, you simply walk past anyone who’s waiting for a different bus. And people are quite happy to let you walk past as long as you are actually getting on the bus and not jumping to the front! That way, there’s only always one queue. Brilliant. Then the best queue of all is the one for restaurants which is quite common during lunch peak hour. Here you simply get a number and wait for it to be called. Works great especially if you want to do more shopping and you know how far away you are in the queue. 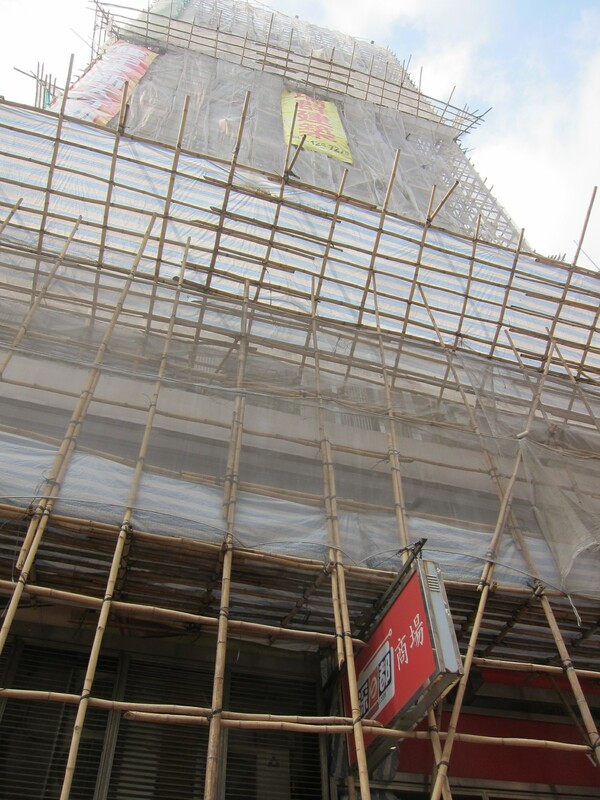 Everytime I walk past a building with bamboo scaffolding, it never ceases to amaze me how they do it. The juxtaposition of bamboo against a high rise modern facade is just too much to breeze past without admiring the work of the bamboo scaffolder. 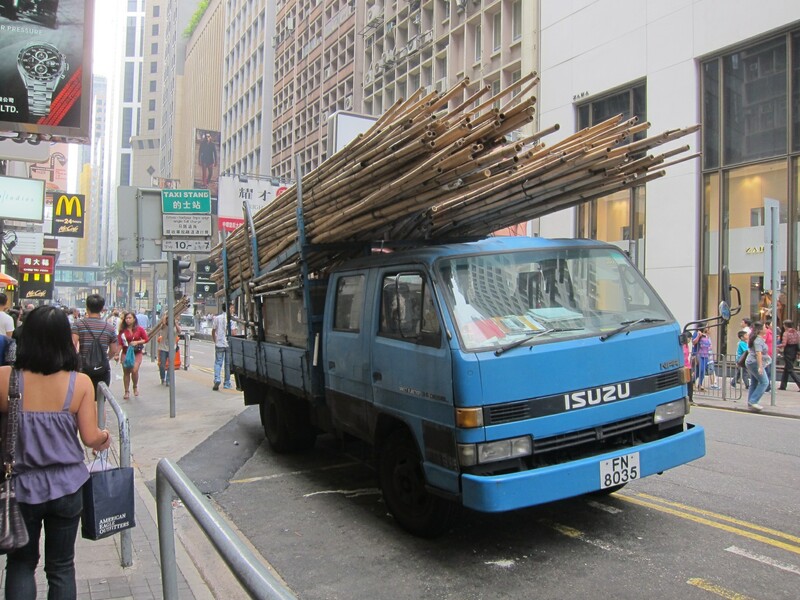 With China banning this practice ten years ago, HK must be one of the last bastions to still use this technique. Even signs can be done with the bamboos extending outwards like a cantilever. 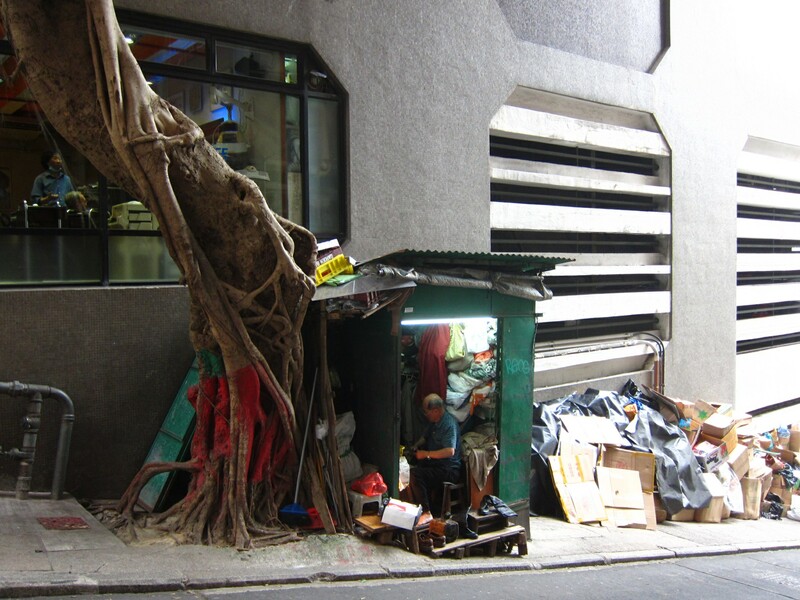 Another amazing sight are the street vendors of HK. They are the ones who work out of the tiniest spaces ala broom closet selling their wares. Tucked into nooks and crannies, they appear in the most unexpected of places such as the one in the photo below of a cobbler. Located just under a tree next to a road, we almost missed him walking past! 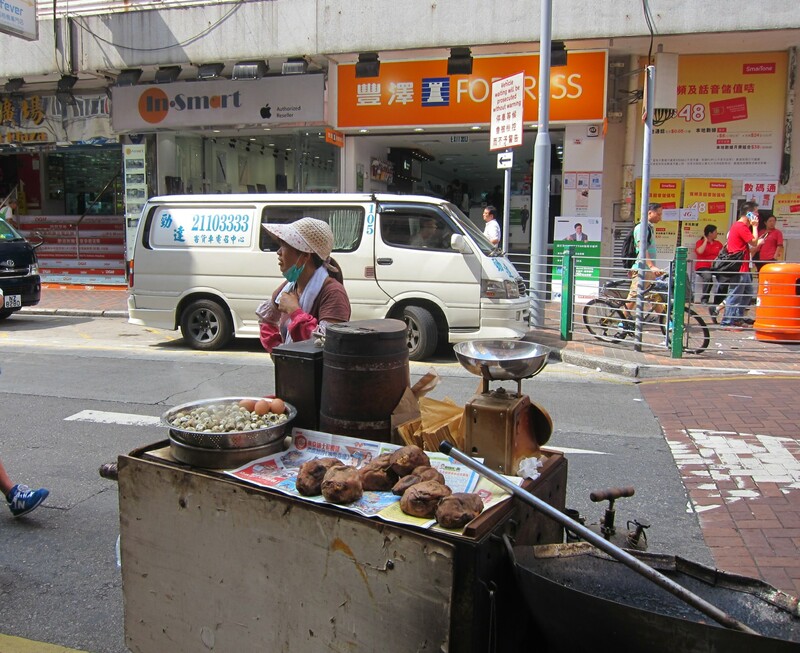 Then there are the mobile vendors such as this one in Sham Shui Po selling eggs, sweet potato and roasted chestnuts. I imagine they can pop up at any location to cater to the lunch time crowds. 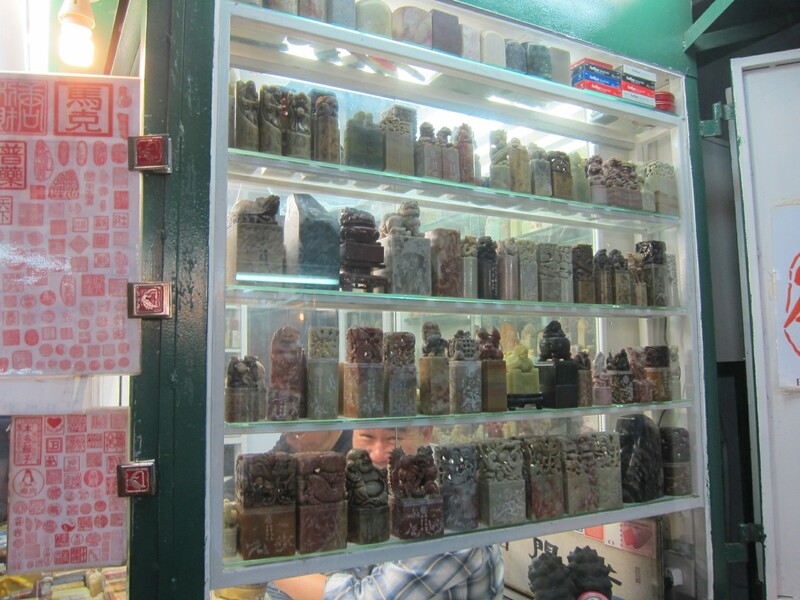 Finally, some of them are also clustered together such as the seal makers of Ma Wan Lane. With the age of the internet and emails, one can only guess how much longer these masters of their craft can still go on making their ‘chops’. Our friend said that in Taiwan, seals are still used for documentation, but in Hong Kong this is less so. 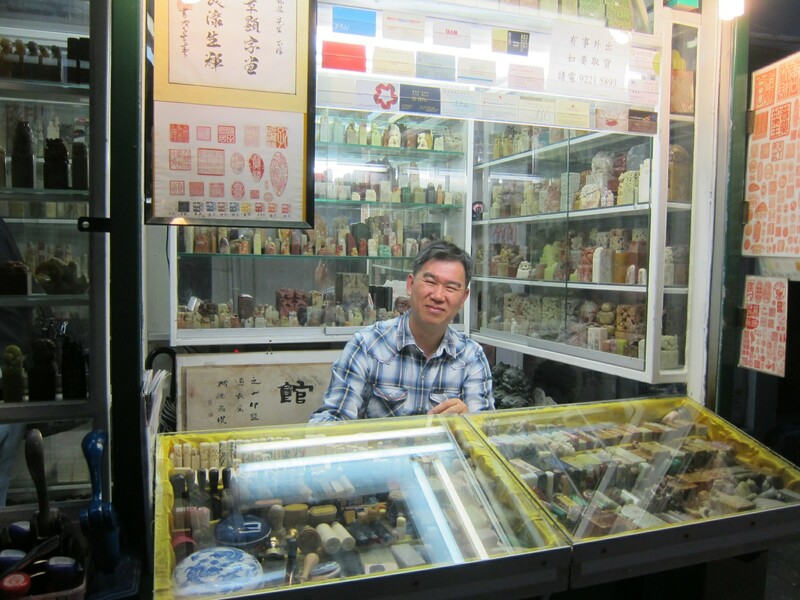 With diminishing demand, I am guessing seal makers sell most of their services to visitors like us keen to take home a memento. Peter liked the seals so much he got one without any engraving but I had to get one with my name on it. After agreeing on the price, we paid a deposit and one hour later it was ready!